Orzo pasta with parmesan and basil is easy to prepare, delicious and goes with just about anything. I sometimes lament the disappearance of dinner parties as a way to gather with friends and family. For me they have always nourished the soul as much as the body and are still the best way I know to guarantee a four-hour chat with great friends. 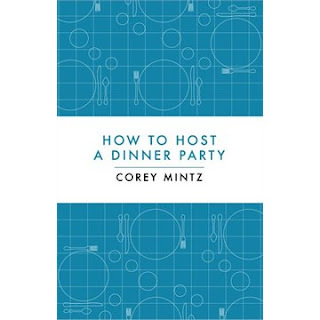 I was recently given a book called “How to Host a Dinner Party” by author Corey Mintz. To be honest I thought it was going to be a dull and fussy how-to manual that would make hosting a dinner party seem a lot like assembling a gas barbeque. I read it on a flight home only because I forgot my novel in my checked luggage. We host a lot of dinner parties and it’s still a good lesson, which brings me to this recipe for orzo with parmesan and basil. This is a dish that appears at a lot of our family gatherings, especially in the summer. It seems to go with just about anything, is easy to make and is a nice change from standard pasta dishes. It’s the sort of pasta that you serve as a side dish, like you would rice. In fact, orzo looks a bit like rice which is how it got its name. Serve this with chicken, shrimp or scallops and a salad for an easy dinner party meal. I have written the recipe as it appears in the book, Aces (the Best of Bridge series), but I do make it a little differently. 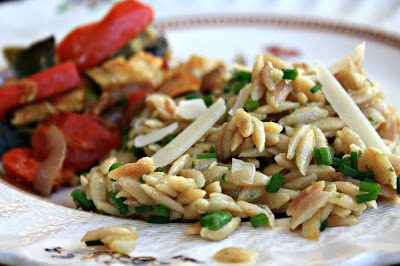 I use kamut orzo instead of regular orzo (look in the natural food section of the grocery store). I dice a small onion and sauté that in the butter for a minute before adding the orzo. Sometimes I add a clove of garlic with the onion. The recipe is also delicious with a bit of feta added. And before serving I give it a squeeze of lemon juice and a bit of lemon zest. Chives are another tasty addition. Add orzo and sauté 2 min, stirring.